Each year, SAALT coordinates Be the Change (BTC), an annual national day of service to inspire and foster civic engagement and community building through volunteerism and community service. Thousands of participants across the country contribute numerous hours of community service in the spirit of Mahatma Gandhi’s famous challenge, “Be the change you wish to see in the world”. This year, Be the Change falls on Saturday, October 5, 2013. We invite your city and campus to join us for Be the Change 2013! 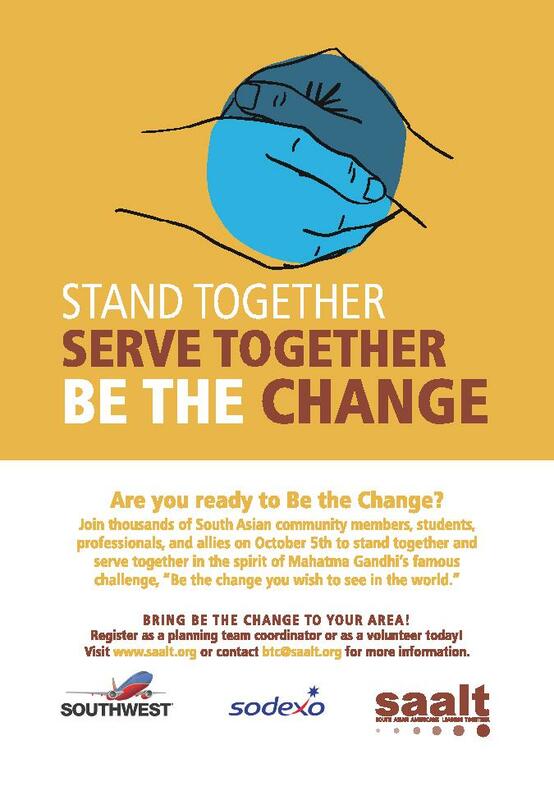 Be part of our national movement of South Asian American civic engagement and community building through service!